Question: What Do You Do With A 55 Year Old Baby Dress? Answer: You hang it in a 57 year old bathroom. It's my dress! A litte pink sleeveless satin dress under a beautiful short sleeved layer of lace. 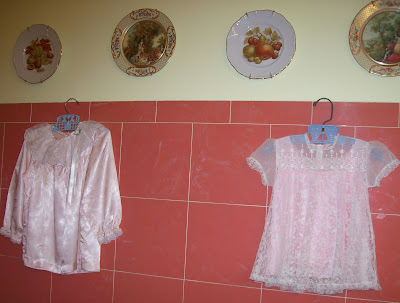 And add your daughter's peachy pink satin dress with lace collar, both with vintage blue children's hangers. My beautiful daughter in her dress in 1988. Both were perfect for my vintage bathroom with pinky peach coral tile. I love decorating with items from the past. Do you? Lovely little dresses. I like the plates on the wall too. Thanks for visiting my blog. I'm a new follower and hope you have a super weekend! I love your sweet dress! 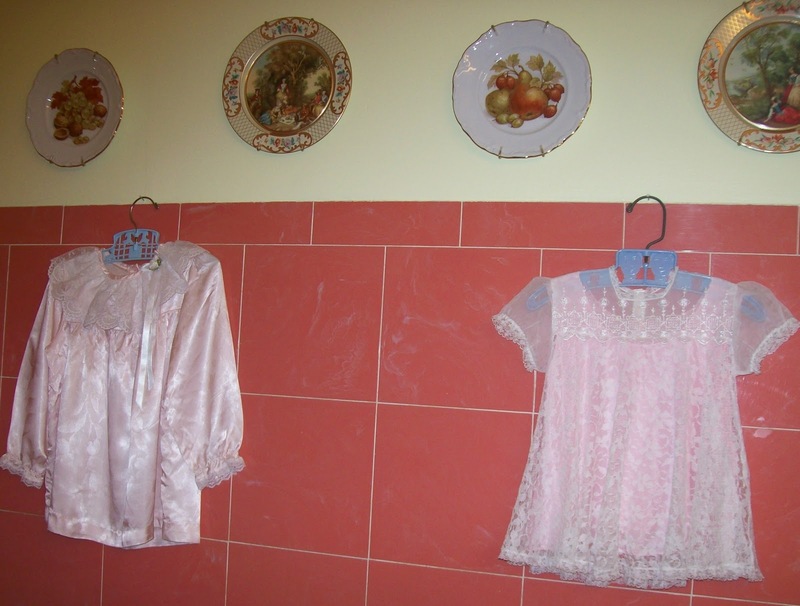 I have a vintage pink bathroom that's very small so no room for much decorating but I love your idea. And how fun that you have a photo of you wearing it. I'm your newest follower and I hope you can pop over to Cottage and Creek and follow back. Happy New Year!